It is summer time and what is better in the summer but ice cream. Ice Cream is a great treat when it is so hot outside. You might remember that I have shared a little about Tillamonk before. Tillamonk makes many great cheeses, yogurts, ice cream, and now Ice Cream Bars. I was recently sent a variety of the yummy Tillamonk Ice Cream Bars to try. There are 4 different flavors of Tillamonk Ice Cream Bars, Lemonilla Tillabars, Mooocha Latte Tillabars, Old-Fashioned Vanilla Tillabars, and Salted Carmel Swirl Tillabars. Lemonilla is vanilla ice cream that surrounds a tart lemon sorbet and then is dipped in white chocolate. The Mooocha Latte Tillabar is made with creamy coffee ice cream with a surprise chocolate center surrounded by a dark chocolate shell. 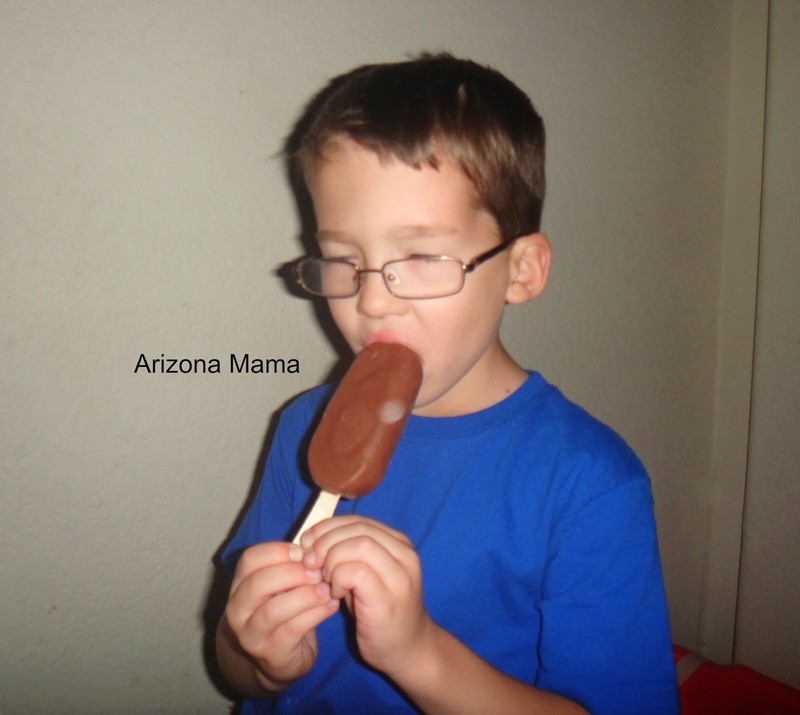 The Old Fashion Vanilla Tillabar is old fashion vanilla ice cream with a milk chocolate shell. And he last bar is the Salted Carmel Swirl tillabar that is made with a rich vanilla ice cream mixed with a salted Carmel swirls and a milk chocolate shell. When we received the package I was just as excited if not more then Jayden to try them all out. Jayden is my chocolate lover. We all decided to try a different bar. Jayden tried the Old-fashioned vanilla tillabar, John tried the Mooocha Latte Tillabar, and I tried the Salted Carmel Swirl. Evan shared with me as usual. I immediately fell in love with my bar and didn't really want to share with Evan. Jayden was so happy and loved his, but wanted to sample mine and Johns too. Another day we tried the Lemonilla. All the bars are so good. We all pretty much decided on a different favorite flavor. The only thing I can think of that I don't like about these bars is that they only come in a 3 pack. With my family of 4 its hard to purchase things that come in 3. We either have to share or buy 3 packs, but then we have extra. I think 4 is a good even number and it should come in a pack of 4, plus that means we get a little more. You can find Tillamonk products at your local grocery store. I usually find it at Safeway. The look so good. Sadly I looked to see but they don't sell them anywhere near me. I don't know if they sell their products up here in MA, but I will have to be on the lookout. They sound great. I was thinking at first, aren't they famous cheese makers? Well, if they are good at one dairy product, then I would love to try this, I am sure they do ice cream well also! I would not be able to get these since i am in the UK but they look really good. I had no idea Tillamonk made ice cream too. Thought they just made cheese. That ice cream looks really delicious. I have never heard of this brand but it sure looks good! Thanks for sharing! I had never heard of this brand before. I am not a big fan of ice cream but boy is my family!! We will have to give it a try! Since moving to MI from OK I am without a Safeway. BOoo lol, these look really good! I have been hearing about these and wondered if they were any good. Sounds like it so I'll have to pick up a box on my next shopping trip! This is a new brand to me...I will check the market for them. I love a good ice cream bar. Pass me the ice cream! These look tasty! A Mooocha Latte Tillabar sounds amazing! I wish this brand was available near me. Oh these look delicious! I've never heard of this brand up here in Canada, but they look delicious. I have never heard of this brand. They look delicious. I will have to keep my eyes peeled next time we are looking for a treat. I love Tillamook products, especially the cheese and ice cream. These ice cream bars look and sound amazing! I want some!!! lol I got an ice cream treat at the 4th celebration last night, and my son got a frozen treat too. He kept wanting to sample mine. It's a good thing I love that kid. ;) These look great! Love these type of bars. My favorite would be Salted Carmel Swirl Tillabar. That would be top in the line in my book! I've seen Tillamook cheeses. I didn't know they made ice cream! I've never heard of Tillamonk before but those ice cream bars look good. I'm going to have to see if they're available around. I haven't heard of this brand, but they look delicious! I'll have to see if they're in my area! I love eating ice cream bars during the hot summer months. I will check and see if that brand is available in Canada. I've had their cheese, but never anything else. That ice cream sounds wonderful! Tillamook makes the best ice cream in the World! I like the Ice cream bars and it is so hot right now that it really does make a good treat! Tillamook makes the BEST cheese ever, I HAD NO IDEA THEY MADE ICE CREAM?!? !Pure celestial genius, I have no doubt it is devine..and now the hunt begins.. The salted caramel swirl would surely vanish quickly around here - those bars look quite tasty.